After several high-profile work accidents in the U.S. over the past several months, we are faced again with the tragic deaths of 11 workers on an oil rig in the Gulf of Mexico. The Deepwater Horizon, a semi-submersible drilling rig off the southern coast of the U.S. caught fire two weeks ago, killing 11 workers and leading to a massive environmental catastrophe. 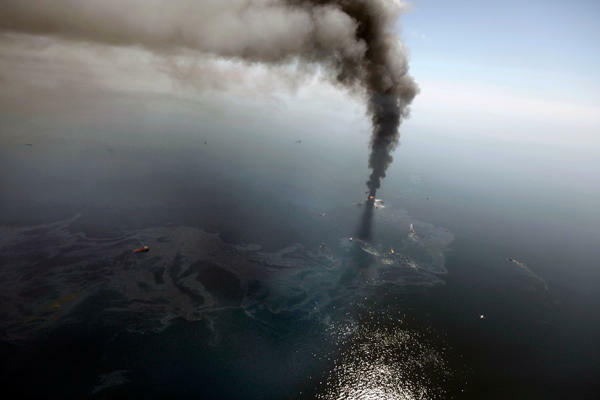 The National Oceanic and Atmospheric Administration has said that the spill spans more than 60 miles across, with some of the spill reaching Louisiana’s beaches, wreaking havoc on the local environment, as well as the shrimp and tourist industries. A congressional committee has been created to investigate the failure of a “blowout preventer” on the rig, as well as other pieces of safety equipment which seem to have failed. The investigation will have to uncover who is responsible for the disaster. There are three companies which have operated on the rig – BP, which bankrolled the exploration; Transocean, which owned and operated the vessel; and Halliburton, which did cement work on the ocean floor. It should come as no surprise that the company bankrolling this disaster, BP spent $3,650,000 in lobbying expenses in 2006 alone, no doubt to influence regulations. The company is one of the largest oil corporations in the world. According to Beyond Petroleum (formerly British Petroleum, or BP), the rig was drilling 18,000 feet down to get to pockets of gas and oil under pressure when it caught fire. The rig reportedly lacked a last-ditch safety valve, an “acoustic switch,” that could have potentially averted the massive oil spill. Such safety mechanisms are common in many oil rich countries around the world, but are not mandated in the U.S. because of their high cost. In 2006, BP pleaded guilty to felony charges after an explosion at their facility in Texas City, Texas, killed 15 workers and injured 170 others. Despite Bp’s own rules to the contrary, they had parked trailers full of workers in an open area right next to the broken machinery. At the mandatory safety meeting that morning, management didn’t once mention the dangerous procedure that would soon be taking place. But management in London didn’t listen, and the company flourished as a result. BP made a profit of $19 billion that year. Nearly a year afterwards, the company again faced controversy when it was discovered that one of their pipelines had leaked nearly 4,800 barrels of oil into the Alaskan wilderness. The leak was caused by the company’s refusal to check its expansive pipelines in Prudhoe Bay. In a leaked memo, inspection and quality-assurance specialist Bill Herasymiuk warned BP’s corrosion, inspection, and chemical team warned of an impending “catastrophe” if practices in the company were not changed. Sure enough, four years after it was instructed to inspect it, BP found that a six-mile length of pipeline was corroded. Despite repeated oil disasters of catastrophic proportions, regulation has remained lax. It should come as no surprise that the company bankrolling this disaster, BP, spent $3,650,000 in lobbying expenses in 2006 alone, no doubt to influence regulations. The company is one of the largest oil corporations in the world. The lobbying has paid off. As it stands today, BP’s economic liability in this catastrophic event remains capped at a mere $75 million, thanks to the Oil Pollution Act. The Act was passed in 1990, in response to the Exxon Valdez oil spill, and enjoyed broad Republican and Democratic support. Indeed, Democrats have done little better than Republicans in standing up for either workers rights or environmental restoration, despite the widespread support they receive from progressive organizations. This disaster, however, couldn’t have highlighted the futility of supporting the democrats anymore than it has. The catastrophe comes only weeks after Obama announced he would expand offshore drilling, despite repeated campaign promises that he would maintain a ban on the destructive practice. “Thursday’s announcement is the first time the Obama administration has actually put the brakes on a plan to open up more areas of the country to offshore drilling. The orignal, full article can be found at the Trial by Fire. I don't know where I read it but one oil worker who escaped said that the survivors were kept isolated for about 40 hours after the "accident" and forced to sign bits of paper waiving responsibility on the company (not BP, the sub-contractor). I think that the number of seriously injured was around double that of those killed and these deaths and injuries, as usual, were largely overlooked. The guy talking about the explosion described a horrific situation. baboon, the workers were also given drugs tests. In that article was in the Guardian as well.